Fernando Verdasco explains the many reasons why his win over Feliciano Lopez at the Barcelona Open Banc Sabadell wasn't easy. Watch live tennis streams at http://www.tennistv.com. Watch as Filip Krajinovic brings up match point in style against Andreas Seppi at the Hungarian Open. Photo Credit: Peter Zador/Hungarian Tennis Association. Watch live tennis streams at http://www.tennistv.com. Watch as Diego Schwartzman shows off his superb touch on Monday at the Barcelona Open Banc Sabadell. Photo: Barcelona Open Banc Sabadell. Watch live tennis streams at http://www.tennistv.com. Watch as Jaume Munar outdoes Pedro Sousa on Monday at the Barcelona Open Banc Sabadell. Watch live tennis streams at https://www.tennistv.com. Dominic Thiem talks about this week's Barcelona Open Banc Sabadell and looks back at the Rolex Monte-Carlo Masters. Watch live tennis streams at https://www.tennistv.com. Watch highlights as Diego Schwartzman and Fernando Verdasco advance on Monday at the Barcelona Open Banc Sabadell. Watch live tennis streams at http://www.tennistv.com. Photo: Barcelona Open Banc Sabadell. Watch as Nicolas Jarry celebrates revenge against Marcel Granollers on Monday at the Barcelona Open Banc Sabadell. Watch live tennis streams at http://www.tennistv.com. Diego Schwartzman could have been seeded at the Barcelona Open Banc Sabadell, so how did he end up in qualifying? Watch live tennis streams at http://www.tennistv.com. Kei Nishikori is ready for another big week at the Barcelona Open Banc Sabadell. Watch live tennis streams at http://www.tennistv.com. 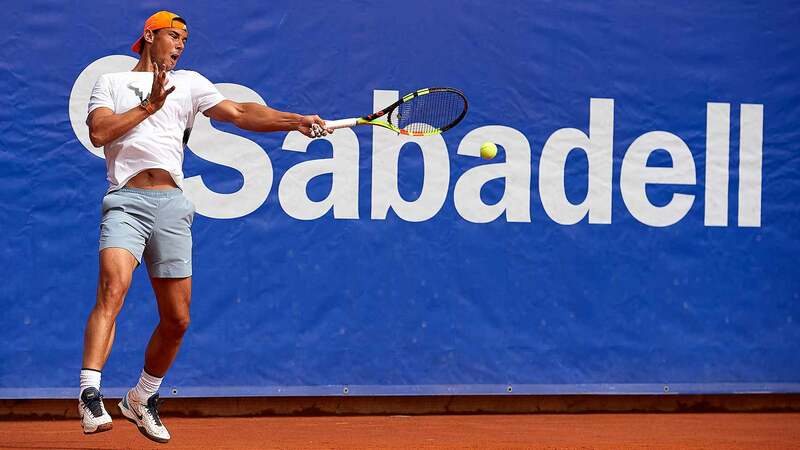 Rafael Nadal is eager to lift a 12th title at the Barcelona Open Banc Sabadell. Watch live tennis streams at http://www.tennistv.com. Relive the best of the action from the 2019 Rolex Monte-Carlo Masters. Photo Credit: Clive Brunskill/Getty Images. Watch live tennis streams at http://www.tennistv.com. Fabio Fognini reacts to winning the Rolex Monte-Carlo Masters for his first ATP Masters 1000 title. Watch live tennis streams at http://www.tennistv.com. Watch highlights of the Rolex Monte-Carlo Masters final in which Fabio Fognini defeated Dusan Lajovic to win his first ATP Masters 1000 title. Photo Credit: AFP/Getty Images. Watch live tennis streams at http://www.tennistv.com. Relive the best of the best from the 2019 Rolex Monte-Carlo Masters. Photo: Clive Brunskill/Getty Images. Watch the best hot shots from the 2019 Rolex Monte-Carlo Masters. Photo Credit: Clive Brunskill/Getty Images. Watch live tennis streams at http://www.tennistv.com. Watch Fabio Fognini fire a rocket of a backhand passing shot for a winner in the Rolex Monte-Carlo Masters final against Dusan Lajovic. Photo Credit: Clive Brunskill/Getty Images. Watch live tennis streams at http://www.tennistv.com. Watch Fabio Fognini hit a perfect backhand drop volley in the Rolex Monte-Carlo Masters final against Dusan Lajovic. Photo Credit: AFP/Getty Images. Watch live tennis streams at http://www.tennistv.com. Watch Dusan Lajovic crush a backhand pass down the line for a winner against Fabio Fognini in the Rolex Monte-Carlo Masters final. Photo Credit: Clive Brunskill/Getty Images. Watch live tennis streams at http://www.tennistv.com. Dusan Lajovic tracks down everything Fabio Fognini throws at him in this incredible rally at the Rolex Monte-Carlo Masters. Photo: Clive Brunskill/Getty Images. Watch live tennis streams at http://www.tennistv.com. Watch as Tommy Paul strikes a final Hot Shot at the ATP Challenger Tour event in Sarasota, en route to claiming the title. Watch Horacio Zeballos and Maximo Gonzalez play incredible defence to eventually win a point in the Rolex Monte-Carlo Masters semi-finals. Photo Credit: Clive Brunskill/Getty Images. Watch live tennis streams at http://www.tennistv.com. Watch a compilation of Fabio Fognini's winners in the second set of his victory against Rafael Nadal at the Rolex Monte-Carlo Masters. Watch live tennis streams at http://www.tennistv.com. Watch Fabio Fognini defeat Rafael Nadal and Dusan Lajovic beat Daniil Medvedev to set a surprise final at the Rolex Monte-Carlo Masters. Photo Credit: AFP/Getty Images. Watch live tennis streams at http://www.tennistv.com.